BROWN BEAR RADIUS - PLEISTOCENE SERBIA. BROWN BEAR RADIUS - PLEISTOCENE, SERBIA. Complete radius of a Brown Bear. from a cave deposit. 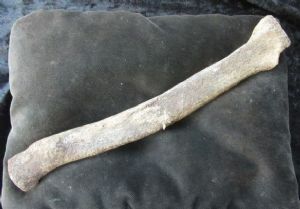 This bone dates back to when Yugoslavia was still one country. Brown bear bones from Serbia are seldom if ever offered for sale. Collector's item. The surface of the bone has been naturally etched by ground water acids. Very unusual piece.